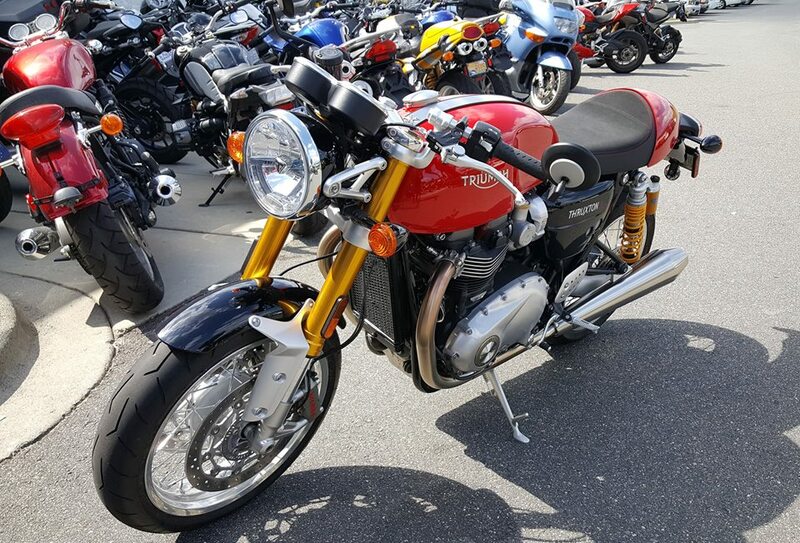 Yesterday I had the opportunity to ride a brand new Triumph Thruxton R 1200. This bike was absolutely amazing in it’s composure and balance. It didn’t care what gear I was in… you could lug it… you could wind it out. Six speed transmission and the engine couldn’t care less…. Riding position is a bit leaned forward, but not enough that your holding yourself up by the wrists… It’s almost a Standard. Very comfortable. It’s so much better than the old Bonny engine, which was an 865… and fine for… the 80’s… I guess. It was fine before… but somehow just a little lacking. Now, the new 1200 engine – which looks and feels weight wise like the same engine as before… is just so much BETTER at everything. Better top end. Better torque. Better power delivery from idle to redline… it’s just all completely better. Having not ridden in some time, I was kinda nervous. But once I threw a leg over and grabbed those Clip Ons… it just felt RIGHT. The bike didn’t feel like it was in a hurry to go fast – but it was. It cornered easily like you had already done that a thousand times. The handling was very neutral, with no drama. It turned in well, with no feeling of sluggishness or twitchiness. It stayed remarkably stable through the curve and powering out passed the apex. The suspension was a very nice balance between comfort and road feel… You felt everything, but nothing hurt your spine or your gentleman’s nuggets. The seat feels both firm and comfortable as well, and you could easily spend enough time in the saddle to run from a full tank to vapor. The bike was just a very pleasant, willing, and spirited companion. It’s been awhile since I rode it about a month ago now… And I’ve ridden pretty much everything else in between then and now. So I wanted to revisit the “Thruster”. I am pleased to say that the Thruxton R has remained my favorite Sport Bike. The Bike is just hands down a pleasurable experience. The big bore engine makes effortless power, which translates into effortless motion. For a Twin, the Thruster is exceptionally smooth. And it’s extremely well behaved. In Rain Mode and Road Mode, the Thruster is the perfect gentleman. In Sport Mode, it gets straight up Dashing. It can keep up with most every other sport bike on the market save for the 200 horse power Ground Rockets. But it’s not trying to be a Race Replica… It’s only trying to be just what it is… a well built classic sport bike that can have fun carving canyons, and while doing so, it will be more relaxed, comfortable, and composed… It’s the Nicest of Sporting Motorbikes you will ever throw a leg over. I just love this thing. Honestly, I can’t think of a single thing to do to it to make it better. I always liked triumphs. Neat bike. They certainly rock to their own beat. The new version though, is truly better than they ever were, without giving up on that classic vibe. Just out of curiosity, what was your problem with the 865 motor? I know they were under powered for their size, and not all that smooth, but even the new 1200 can’t compete with rival bikes of the same size. Let’s face it, it’s a British twin. Maybe its just me, being weened on a 650cc/single carb/4 speed pre-unit triumph, the ’07 865 Bonnie I owned was incredible. Was it the power house of my V-Max, or even the smooth power band of my shortly lived Virago? Certainly not. But It wasn’t a bad motor for what it was. Realistically, the Thruxton is, and always was, a sporty cruiser/standard with a “Cafe racer” personae. If you want a real thrill on a Trumpet, take a Speed Triple for a ride. The idle exhaust note alone should give you a thrill. Well, you nailed it, didn’t you? And as I said, the new engine is “Better”. So much better. So very much better. Yes, there are other 1200’s out there that are better – but again, as you said, “It’s a British Twin”. It has its own character, as does the Bonney and Thruxtons that make it an unfair comparison to the other engines because those don’t matter – they are not Classic Triumphs. There is something different about these machines that can only be appreciated after you have ridden one. This is, I just realized, the same justification for Harley’s rigid adherence to their own conformity. I will buy a new bike and a couple spares if the future is going to be self driving electrics! I saw that as well. Thank goodness not all Concept vehicles actually get built.